Poor Kate is being driven mad by her mum’s rules for good behaviour – so in desperation, she writes to the Queen, asking for help with her manners. But when the Queen invites her for tea, will Kate learn to be polite? Or will something wonderfully unexpected happen? 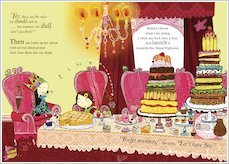 Teaching key table manners whilst also delighting in sending them up, this anarchic rhyme brims with delicious chuckles. Illustrated with fantastically funny artwork, and full of cheeky ways to have fun with food, it will thrill any youngster who has ever been told off at the table! Cupcakes You Don't Have to Cook! Make cupcakes fit for a Queen with Kate from Don’t Eat Your Chips. Cut out and create your own collage with this sheet colours and designs. A star chart to help you eat your veggies, brush your teeth and get to bed on time with Kate from Don’t Eat Your Chips. a book for kids about mealtime manners. 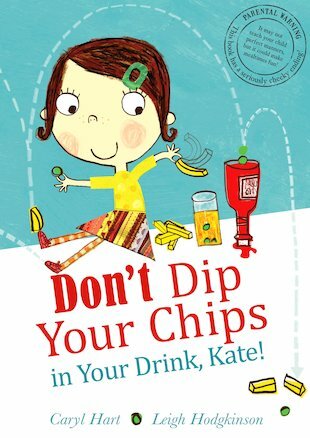 Leigh Hodgkinson won the Community Library Favourite Book prize for Don’t Dip Your Chips in Your Drink, Kate! at the 2010 Sheffield Children’s Book Awards.